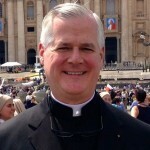 Today’s column is an edited version of the homily Fr. Murray gave at the Funeral Mass for his father, Gerald E. Murray Sr., who died on September 1, 2017 at the age of 86. Kindly remember his soul in your prayers. Life is changed not ended. This truth of our faith is based on Christ’s promise that those who are faithful to Him on this earth will be with Him forever in Heaven: “Come, O blessed of my Father, inherit the kingdom prepared for you from the foundation of the world.” (Mt 25: 34b) Our Lord welcomes in Heaven those who have served him faithfully on earth. But to serve our unseen God in holiness and truth requires that we have faith in Christ, who walked among us 2000 years ago and continues to be with us through the power of his grace. We must all fight the good fight of faith against spiritual laziness, doubt, or temptations to disbelieve. We must stake our lives upon the truth of Christ’s words: “I am the way, the truth and the life.” It is not enough to know that Our Lord said these words, or that others believe them to be true, or that they have inspired the saints to do great things for God throughout history. Faith is a duty because we owe to the one who made us and redeemed us the homage of loving obedience, ever seeking to know his will and to put it into practice. A mind enlightened and strengthened by grace and convinced of the truth of Christ happily has only one path to follow: Christ – the Way, the Truth and the Life. My father was a serious Catholic. His joy as a believer was rooted in the solidity of the Church founded upon the rock, and upon the unchanging teaching of Christ. That doctrine taught him what to love in this world, and what to turn away from as displeasing to the Lord. He benefitted greatly from his eleven years of Jesuit education: Regis High School, St. Peter’s College, and Fordham University. He often said that he owed the Jesuits at Regis a tremendous debt of gratitude for the spiritual, intellectual, and moral formation he received. He was a guard on the 1948 undefeated varsity basketball team. He was an actor in the drama club. Both of these activities prepared him well for his life as a husband, father, and lawyer. He knew what teamwork meant. He appreciated persistence in seeking to achieve a goal. As regards acting, he was fond of quoting George Burns: “Sincerity – if you can fake that, you’ve got it made.” Dad had no need to fake sincerity. He knew that there are many ways to present honestly a winning argument when the point at issue was worth arguing for. His greatest reason for gratitude to the Jesuits, however, consisted in the fact that back in the fifties, even in law school, a student could not sit wherever he wanted to sit, as is the practice today. No, each student was assigned a seat according to that age-old system of alphabetical discrimination known as assigned seating by last name. When Mr. Gerald Murray arrived at his first law school class he found himself sitting next to Miss Mary Jane Moyles, much to his great delight, given that she was one of only three women in the day session, and hence the undoubted object of heightened interest by various young men whose last names began with say, A, B, C or S, T or W. Law school classes go on for hours and hours. Those guys never had a chance. This gentlemanly graciousness did not mean that he was a pushover. I remember once in my youthful argumentativeness attempting to refute something he said with the remark: “Dad, that is something out of the Middle Ages.” To which he calmly responded: “What’s wrong with the Middle Ages?” On later reflection I saw that Dad was not only right, but that he was trying to get me to think reasonably, avoiding recourse to facile slogans that are nothing but substitutes for thought. Newman said: “Nothing is more common than for men to think that because they are familiar with words they understand the ideas they stand for.” Dad was a man who knew the meaning of words, of the ideas conveyed by those words, and of our need always to seek the truth, because that is what brings us closer to God, and thus to one another.